There is currently just the 1 ferry route running between Koh Mak and Koh Kood operated by 1 ferry company – Boonsiri High Speed Ferries. The Koh Mak (Ao Nid Pier) to Koh Kood (Ao Salad Pier) ferry crossing operates weekly with a scheduled sailing duration from about 40 minutes. Whilst we’ve taken great care to ensure the information on this page is correct, as the frequency and duration of crossings on all routes can vary from time to time we’d advise that you get a live quote for current availability on this Koh Mak Koh Kood crossing between Koh Mak (Ao Nid Pier) and Koh Kood (Ao Salad Pier). 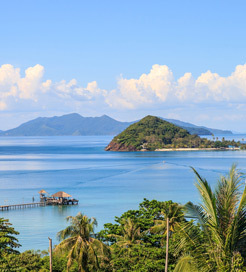 Koh Mak is a small Thai island of Trat Province in the Gulf of Thailand, close to the Cambodian border. Measuring only 16-square-kilometres and boasting secluded beaches devoid of bustling tourist hotspots, Koh Mak is the ultimate island getaway. The sandy shorelines are world-beaters and the waters offer some of the finest snorkelling and diving spots in the country. Away from the picturesque beaches lies an idyllic Buddhist temple in the heart of the jungle, as well as 3 fishing villages which are well worth visiting, too. Koh Mak is a useful stop-off point before sailing to the popular island of Koh Kut to the south, with frequent high-speed crossings departing from the pier on the southeast coast. The mainland is also within easy reach by ferry, making Koh Mak a great departure point for exploring some of Thailand’s top destinations.